New Santa Pod Ticket Shop Goes Live. Click, Print and Arrive in 2012! Santa Pod Raceway, the home of European drag racing has just unveiled its super-smart and ultra-convenient online ticket store. 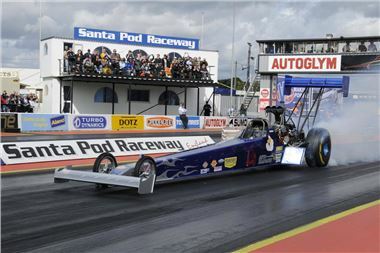 Santa Pod has invested in the latest ‘Ticketmaster’ software, which allows customers to quickly buy and acquire their show tickets for any of Santa Pod’s 2012 events. in mind if you’re looking for the ultimate in convenient Christmas shopping for the petrolhead in your life! Of course, if you’re the type of person that still prefers the human touch, the ticket and gift sales hotline, staffed by real people, right at the track itself, is still there to talk you through the whole Box Office process. Call them on 01234 782828.